Former world No. 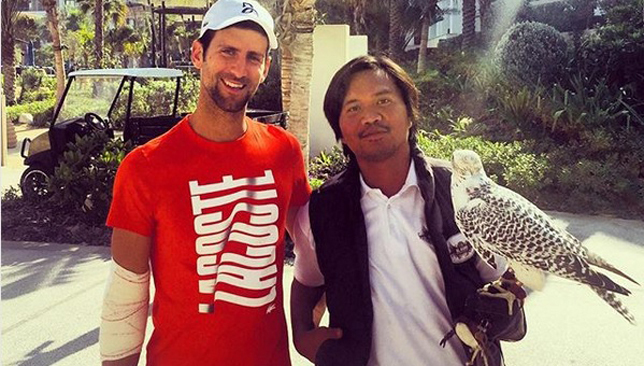 1 Novak Djokovic is still in Dubai as was spotted wearing a bandage over his injured elbow that forced him to withdraw from the Mubadala World Tennis Championship in Abu Dhabi as well as this week’s Qatar Open. Djokovic had told Sport360 last week that he was looking forward to beginning the new season “pain-free” but suffered a setback that forced him to delay the start to 2018. The 12-time Grand Slam champion has made no public announcements regarding whether he will play the Australian Open in two weeks’ time or not but admitted his latest injury setback could force him to adjust his schedule. 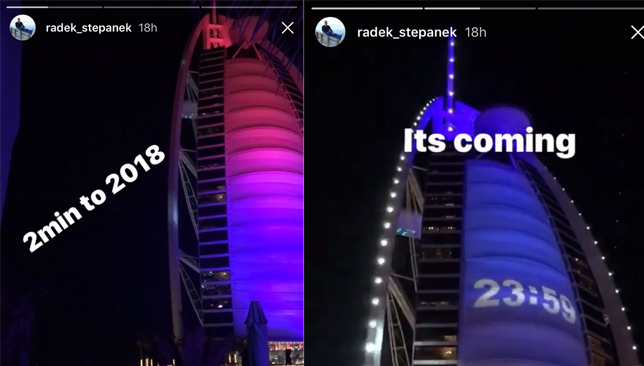 His coach Radek Stepanek is with him here in Dubai, which is positive sign that Djokovic could be at least practicing. Via Radek Stepanek’s Instagram story. Two days ago, world heavyweight champion Anthony Joshua posted a photo of him and Djokovic with the Burj Al Arab hotel in the background. If Djokovic does end up playing the Australian Open, he would have to dust off some serious rust having not played a match since Wimbledon last July. Madison Keys dealt with her tight opening round defeat to Johanna Konta at the Brisbane International with great perspective and lots of positivity after the pair put on an impressive show to start the new year. In a first round clash between two players ranked No. 9 and No. 19 in the world, it was the higher-ranked Konta who came out on top 4-6, 6-4, 6-3 in a two-hour seven-minute battle. “It was damn good tennis today so… I haven’t played a match in four months so I was like it’s a win for me,” said a smiling Keys, who is back to full health now after going through wrist surgery early last year. Great start: For Jo Konta. 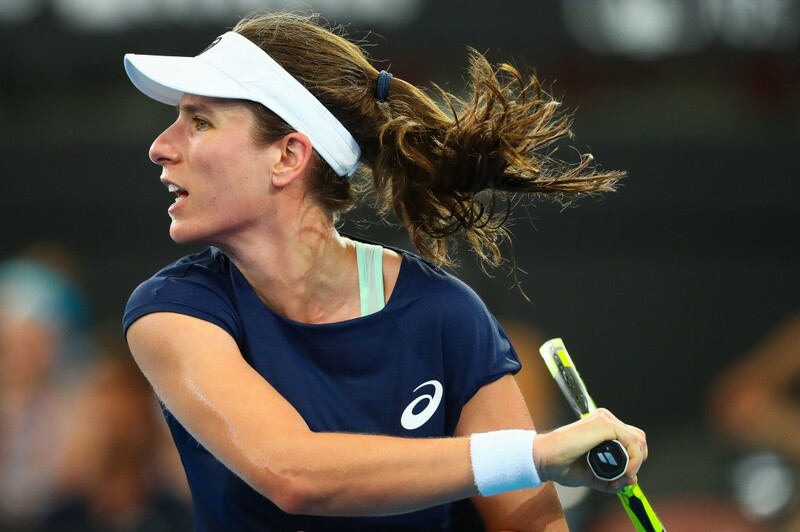 Konta had not won a match since August and ended 2017 with five consecutive defeats while struggling with a left foot injury. The 26-year-old Brit is pleased to put that all behind her as she started 2018 in fine fashion, under the guidance of her new coach Michael Joyce, who previously worked with Maria Sharapova. “It feels good to come through a match like that especially in three sets and especially against someone like her but I never lost faith in my ability,” said Konta of her win over Keys. Keys, a runner-up at the US Open last September, is upbeat about her start to the season despite the loss. “That match could have happened late in a Grand Slam or in the finals of another tournament, happened first round. Too good,” said the 22-year-old American. Konta next faces Croatia’s Ajla Tomljanovic, who was the runner-up at Al Habtoor Tennis Challenge in Dubai less than three weeks ago. Ukraine’s Elina Svitolina believes she can become world number one in 2018 despite a host of challengers for the coveted top ranking. 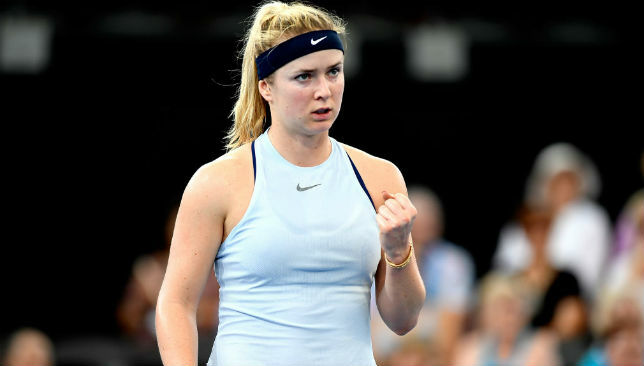 Svitolina, currently ranked sixth in the world, was speaking after an impressive 6-2, 6-4 win over Spain’s Carla Suarez Navarro in the first round of the Brisbane International on Monday. The 23-year-old cruised through the first set but was forced to fight harder in the second as Suarez Navarro began to find her range with powerful groundstrokes. But the Spaniard faltered while serving at 4-5 and Svitolina was able to close out the match in just under 90 minutes. Svitolina won five titles in 2017 on her way to a career-high world ranking of number three. She said she had worked hard during the off-season and there was no reason why she could not win a Grand Slam or take the top ranking.
.@ElinaSvitolina sets @BrisbaneTennis second round vs. @AnaKonjuh! Five women held the top spot at various times in 2017 – Serena Williams, Angelique Kerber, Karolina Pliskova, Garbine Muguruza and current number one Simona Halep. Svitolina said her ability to raise her game to see off someone as dangerous as Suarez Navarro showed she was also capable of taking the next step. “This match was a good example that I can play a good level of tennis, a high level of tennis,” she said. “So I will try to continue to work and to, you know, to just be focused on these kind of things. Svitolina will take on Ana Konjuh in the second round following the Croatian’s 6-1, 6-2 win over Dutchwoman Kiki Bertens on Sunday. A miserable run by sixth-seeded Frenchwoman Kristina Mladenovic continued when she lost to Belarus qualifier Aliaksandra Sasnovich. Mladenovic, who has not won a match since Wimbledon, raced through the first set before Sasnovich fought back to win 1-6, 6-3, 7-5. In other first-round matches, 2012 champion Kaia Kanepi from Estonia beat Russia’s Daria Kasatkina 6-2, 6-2. Kanepi’s compatriot Anett Kontaveit beat England’s Heather Watson 6-0, 6-3 and Sorana Cirstea of Romania saw off American Jennifer Brady 7-6 (3), 6-1. In the men’s draw Matthew Ebden set up a second-round clash with fellow Australian Nick Kyrgios when he beat Frances Tiafoe of the USA 6-3, 6-2. There was better news for the Americans when Ryan Harrison downed Argentine Leonardo Mayer 6-4, 3-6, 6-2 to book a clash with second seed Andy Murray.